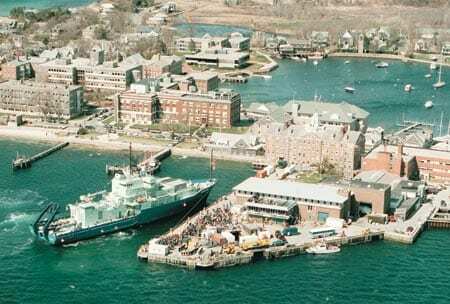 1997— When R/V Atlantisarrived in Woods Hole for the first time on a bright, beautiful April 1997 day, it represented not only a welcome addition to the WHOI fleet but also the culmination of a 15-year UNOLS fleet modernization. We tell this story to illustrate the time and effort involved in acquiring (or modernizing) research facilities, like research vessels, with long lead times. Ships generally have a useful lifetime of 20 years without a major upgrade. A midlife refit, including refurbishing all major systems, will usually extend that lifetime by about 10 to 15 years. In the early 1980s, the academic fleet was facing a crisis. All of its large research ships either needed immediate replacement or soon would (see figure below right). This fleet of large ships, built by the Navy as part of its long-standing policy of outfitting US oceanographers with quality research vessels, represented a huge investment. Its modernization would require considerable effort, commitment, and money. The endeavor kicked off in grand fashion when in July 1984 Secretary of the Navy John Lehman and Chief of Naval Operations Admiral James Watkins announced their “Navy Policy on Oceanography.” It stated, in part, “Oceanographic research ship will be procured. Navy will include $35M in the Ã?Â?87 budget for the procurement of a Navy-owned oceanographic research ship to be utilized by the civilian academic oceanographic research community with a target IOC (Initial Operational Capability) of 1991Ã?Â? The Oceanographer of the Navy and the Chief of Naval Research will jointly develop an oceanographic research ship construction program to be submitted to the Chief of Naval Operations in time for (fiscal year 1987 budget submission). The objective of the program is to insure appropriate deep ocean research platforms are available to meet Navy operational and research requirements.” In the following months, this initiative was fleshed out and developed by the Oceanographer of the Navy, the Office of Naval Research (ONR), and the Naval Sea Systems Command, with significant input from the oceanographic community through UNOLS (University-National Oceanographic Laboratory System), an association of ocean science institutions that operate and use the US academic research fleet. a major overhaul for Moana Wave. Time lines for most of this effort are shown at right. The Knorr/Melville conversions were prompted by poor reliability of the ships due to propulsion plant design. Both were experiencing ten months mean time between drydockings. In addition, they were too noisy for acoustic operations, an essential element of oceanographic research, and too small and lacked the seakeeping qualities to accommodate large science parties for long periods to carry out the global scale programs then being contemplated, especially the World Ocean Circulation Experiment (WOCE) and the Joint Global Ocean Flux Study (JGOFS). The Characteristics chart below right compares the pre- and post-conversion characteristics of the two vessels. After their conversions (and a great deal of TLC from the operating institutions and their dedicated crews), these virtually new ships have performed magnificently. The proof of this assertion is in their post-conversion performance: Both ships have since spanned the globe reliably and served science capably. The objectives of the conversions have been tested and exceeded. Both vessels have carried large science parties on long cruises in waters that would have exceeded their preconversion capacities (see cruise track chart, below right). The Navy plan that grew out of the Lehman/Watkins initiative called for building three new ships and eventual replacement of all five existing AGORs. (This plan has gone through several modifications since its adoption—notably Lamont-Doherty Earth Observatory of Columbia University, operator of Conrad (AGOR-2), opted to acquire, with NSF support, a used vessel that was renamed Maurice Ewing for a noted geophysicist and Lamont Director. Gyre was transferred to the state of Texas and remains in service. The fate of Moana Wave is pending, but it will probably be replaced by another AGOR currently in the design stages. The Lehman/Watkins oceanography initiative had enthusiastic community support. The UNOLS Fleet Improvement Committee (FIC), with major inputs from potential users, wrote a series of scientific mission requirement statements that were used by Navy officials to compose documents that led to awarding of a contract to Halter Marine Inc. of Moss Point, Pascagoula, Mississippi, for construction of the lead ship in the new AGOR-23 class. Through competitive bidding, ONR selected the University of Washington as the operator of the new ship. It would replace and bear the same name as AGOR-9, Thomas G. Thompson. The contract was let in June 1988 and the ship was completed and put into service on 8 July 1991. In FY ’91 and FY’92, Congress appropriated funds for AGORs 24 and 25 respectively to complete the class. Again ONR solicited bids for operator institutions. The Scripps Institution of Oceanography, University of California, San Diego, was awarded operation of AGOR-24 to replace Thomas Washington. 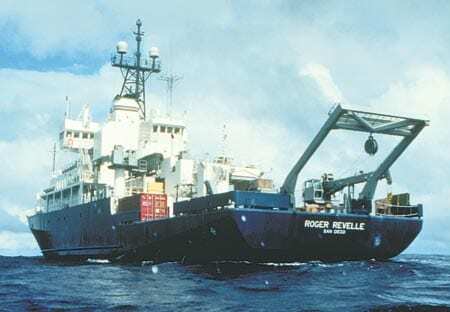 The new ship was named Roger Revelle after Roger Randall Dougan Revelle, a distinguished Scripps graduate (Ph.D., 1936) and former director (1951-1964), who died in 1991 at age 82. Woods Hole Oceanographic Institution also submitted a bid for one of the AGORs. Our proposal involved taking Atlantis II out of service, selling it, and converting Knorr to be the support ship for Alvin. Eventually this plan was modified at the Navy’s behest to make the new Atlantis the National Deep Submergence Support Ship instead of Knorr. There followed some remarkable cooperation and rapid action between federal agencies (especially ONR and NSF), the Naval Sea Systems Command, the shipbuilder, and WHOI to change the ship’s mission statement and the associated SOR (the governing document for building Atlantis) to develop a ship change proposal and negotiate a price. All this was accomplished without delaying completion of the ship. In fact, Atlantis was completed ahead of schedule. In my experience, this sort of major change late in the construction of a ship with the customer (WHOI) providing equipment (the Alvin A-frame) as well as technical and design advice and guidance is unprecedented. It is a tribute to all involved that this effort turned out so well. During the construction of the large ships, WHOI Marine Operations Manager Joe Coburn and the other operators initiated a plan for major midlife refits of the Oceanus class ships: Oceanus (WHOI), Endeavor (University of Rhode Island), and Wecoma (Oregon State University), built in the mid 1970s. This effort was vetted by the UNOLS Fleet Improvement Committee and supported, at a fixed cost of $3 million each by NSF, owner of these ships. The figure opposite below shows the work involved for Oceanus. WHOI and URI cooperated in developing detailed design and contract specifications. NSF and the operators agreed to space these midlife overhauls over three years. They were completed in 1993 (Endeavor) and 1994 (Oceanus and Wecoma). The work packages were tailored to the individual ships (each ship of the class had differences) and to the ships’ perceived clientele. WHOI emphasized open deck area to support mooring work and physical oceanographers. The work on Endeavor was similar to that on Oceanus, except that Endeavor’s after-deck was also extended. Wecoma’s refit was limited to work below the 01 deck. In 1996, the Scripps ship New Horizon was overhauled, completing the UNOLS intermediate-class modernization. There is a very important lesson here. This process took 13 years to complete from the time it was endorsed by Navy leaders, who were responding to oceanographic community suggestions. Even with full support and high priority in Washington from both the Federal agencies and Congress, replacement of ships is a decadal process. 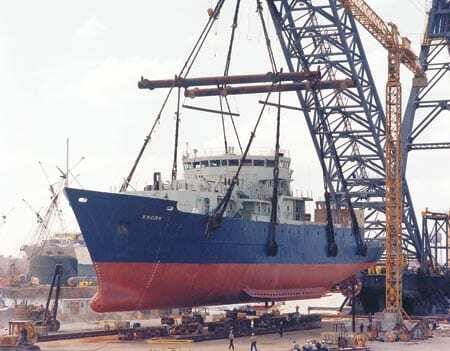 Given a nominal ship service life of about 30 years, planning for ship replacement must begin before the ships to be replaced are 20 years old. Generally, the Secretary of the Navy authorizes the naming of a Navy ship based on recommendations from the Naval Historian and a board convened to review naval vessel names. Individuals involved with Navy oceanography, meteorology, mathematics, and astronomy have usually been favored in the naming of ships. In the cases of the three newest AGORs, this tradition was expanded to include the traditions and sentiments of the operating institutions: Thomas G. Thompson founded oceanography at the University of Washington, Roger Revelle was long-time director of the Scripps Institution of Oceanography, and the Woods Hole Oceanographic Institution has had a ship named Atlantis since its founding in 1930. Because Navy tradition does not include the numbering of ships, the WHOI vessel is called simply Atlantis rather than Atlantis III. 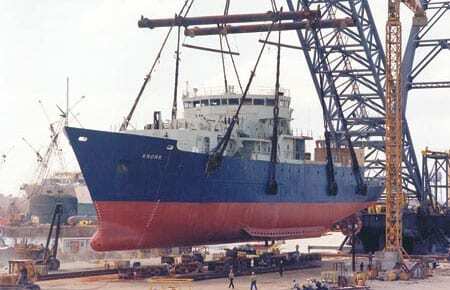 A giant crane lifts Knorr in 1989 as the ship?s refit begins at McDermott Shipyard in Amelia, Louisiana. Knorr and Melville have ranged the world ocean since their refits. Midlife refit upgrades to Oceanus completed in 1994 included a one-third increase in laboratory space, from 1,054 to 1,390 square feet. Science berthing increased from 12 to 15, and an additional 4 berths are also available in a portable van. The heating-ventilation-air conditioning system was fully replaced, and new refrigerators and a freezer were installed along with new main and auxiliary exhaust systems. The ship was equipped with a rebuilt reduction gear, a new crane, a bigger A-frame, a new capstan, a new anchor windlass, and a new emergency generator. The main engine was overhauled and upgraded, and a new structure (forward shaded area) was built to house the pilot house, chart room, and communications room. AGOR-24 was delivered to Scripps Institution of Oceanography in 1996 for operation as Roger Revelle.